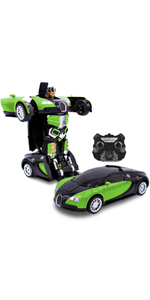 From Transformania Toys, let your kids save the galaxy from evil with their very own kids RC toy car remote control Transforming Robot! 360 degrees spin mode of the transforming vehicle will make your child a champion while fighting in an automobile race with enemies from any direction. 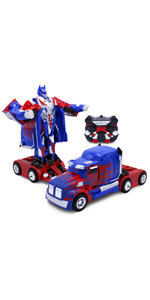 Then with the push of a button, you can easily transform the RC toy from Remote Control Car to Wall Climbing Robot mode, complete with electronic lights and sounds. While your kids playing endless happy hours with our RC Transforming Wall Climbing Robot Car, they will be stimulating several areas of development. Their fine motor skills and hand-eye coordination will improve as they will grasp and push the car. Their cognitive development will be stimulated as they will work how to push the button, how to play with the remote control car and how to drive. This also helps your children to enhance their problem-solving skills. Our kids RC car is the perfect gift for any child that loves cars and robots!